Leeches are bred in a factory near Moscow. Udelnaya is a sleepy town southeast of Moscow, full of muddy roads lined with brightly painted wooden houses. Behind a frozen stream there is one large brick building that looks a little out of place. Inside are hundreds of rows of jars exuding an unpleasant smell. They are full of Hirudo medicinalis, more commonly known as leeches. But few locals are turning up their noses at the presence of so many blood-sucking annelids. Leeches are the flourishing industry in Udelnaya, a bright spot in a Russian economy hurtling into recession. Still, leeches aren't pretty. And neither do they smell nice. The odor from the Center's laboratory is like stale meat in a dirty restroom. It can be detected from far away and becomes close to unbearable when approaching the jars full of leeches  all various hues of red and yellow depending on when they were last fed. 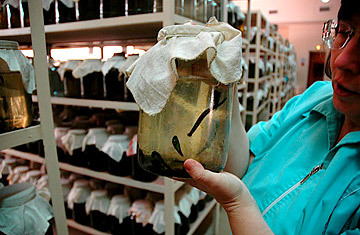 "Leeches urinate non-stop for three days after they are fed," explains Elena Titova, the head of laboratory production, who has worked at the center for 25 years. "You have to clean their jars very frequently during this time; otherwise they poison themselves with their own waste." The other component of the stench is blood. "We feed them certified cattle blood," said Nikonov. "And on national holidays we give them veal blood as a treat." For Nikonov, who was trained as a chemist, breeding the leeches is an art. "It looks like it's just a jar full of water, but there are millions of chemical processes going on." Nikonov believes women are more nurturing than men when it comes to the creatures; and, at the laboratory, each employee raises her own batch of leeches from start to finish. "That way if something goes wrong and thousands of leeches die no one can blame anyone else," says Titova. According to her, leeches are very attached to their owners. She organizes her vacation around their feeding times so that no one else interferes with her lot. When a leech is about to be sold, it has to be starved for three months to be at its most effective. The biggest export market for the Center's leeches is France. Nikonov, however, says that he remains very selective about his clientele. "We are careful about who we export them to," he says. "I know in certain cuisines people put the leech on a goose. They wait until it gets fat on the goose blood and then fry the leech like it's a sausage. This is considered a delicacy. I feel sorry for the leech. They should not be used this way."